Happy Veteran's Day to all. Thank you so very much to all of you who have served our country and all of you who are serving now. 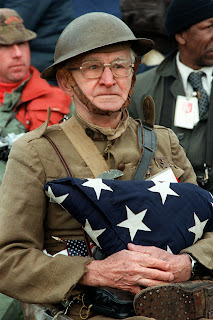 Many have given the ultimate sacrifice so that the rest of us can live in freedom. Many have lost a part of themselves, so that we may live whole. As a nation we must remember our veterans, not just on November 11, but every day of the year. We must honor the memory of those we have lost and we must care for those who are still with us.